Probiotics include various strains of uniquely helpful bacteria that occur naturally on skin and that can be applied via probiotic skincare products. Probiotics work with prebiotics, carbohydrates that serve as a food source so the probiotics can optimally do their job of protecting and nurturing your skin. 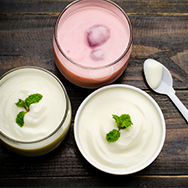 You may already be familiar with the amazing, undisputed health benefits of eating foods that contain probiotics, such as yogurt, kefir, and kimchi, or of taking probiotic supplements. It’s a complex topic that ongoing research continues to investigate—but what we know so far about probiotics’ benefits for skin is just fascinating (at least we think so)! Part of what makes the topic of probiotics so complicated is that they are an array of microorganisms living within and on the surface of our bodies. Adding to the complexity is that each of us has our own distinctive combination of these organisms—what’s known as our microbiome. Only recently did researchers discover that skin has a specialized microbiome, too. To give you an idea of how far the research has come in a short period of time, less than 10 years ago, scientists thought people had about 200 different types of microbes living in and on our bodies; today, we know there are over 10,000 different types of critters sharing space with us! But don’t let that creep you out: They play a vital role in our overall health, well-being, even in how our skin looks and feels. Actually, it’s not a stretch to say that probiotics and other microorganisms are essential to our survival. In short, the microbiome constantly determines which organisms are friend or foe. Its goal is to maintain the delicate balance that keeps things in harmony, trying not to let the bad bugs cause trouble and to let the good bugs do their job. Skin’s surface is a multifaceted environment, almost like a city of living things populating and working in every part of it. Even though the top layers of skin are dead, there’s an abundant population of microflora thriving there, affecting skin’s appearance, youthful or otherwise, every day. This is skin’s microbiome, and keeping it in balance is among the more fascinating parts of how probiotics for skin work. What do we mean by “balance?" Some of the microflora on skin are helpful, some are (or can become) harmful. The good guys are often referred to as “resident bacteria,” while the bad guys are “transient bacteria”; however, although they’re transient, the problems they cause can linger and not go away. Ironically, when skin’s microbiome is out of balance, the good microflora can become bad, leading to issues like acne and red, sensitive skin. Strengthen skin’s surface against environmental threats. Enhance skin’s ability to become—and stay—properly hydrated. Visibly improve signs of dryness, including a tight, uncomfortable feeling. What’s even more fascinating is that probiotics and their derivatives, known as lysates, work beautifully with other skincare ingredients. And get this: As the probiotics break down on skin’s surface, they create brilliant new ingredients for skin, such as hyaluronic acid, peptides, and vitamins, as well as increasing the presence of ceramides. This in turn leads to diminished signs of aging, better hydration, and a radiance that’s visible proof of skin’s renewed vitality. Which Probiotic Ingredients Are Best for Skin? Research has looked at numerous probiotic ingredients for skin, most of which have some amount of benefit. But, just as there is no single best antioxidant ingredient, there is no single best probiotic to seek out in skincare. Instead, a probiotic cream should contain a mix of probiotics, prebiotics (to fuel the probiotics), and lysate ingredients to help reinforce skin’s surface and improve its appearance. Examples of such ingredients include any that begin with Lactobacillus, Bifidabacterium, Vitreoscilla, and various ferments and prebiotic sugars such as xylitol and fructooligosaccharides. Probiotics in skincare products demand careful formulation due to their inherent instability; they’re very fragile and deteriorate easily. This means no jar packaging (light and air cause them to break down faster) and buying products only from brands that have a good understanding of how probiotics work. Knowing which formulary techniques are necessary is essential to getting the best possible results when using probiotics on skin.